The Moon is the Earth’s one natural satellite. Evidence indicates that it formed with the Earth during a planetary collision 4.5 billion years ago. Lack of wind, rain, and continental drift mean its surface preserves billions of years of history. It may also have resources that can help us expand exploration throughout the Solar System. Moon Trek will allow you to explore past and future lunar landing sites. Mars is now a complete desert. But ancient shorelines, riverbeds, and lakebeds on its surface show that water once flowed across Mars. Did it support life in that distant past, and if so, might some of it have survived to today? Continuing exploration by robotic explorers, and plans for future human missions will reveal Mars’ fascinating story! The largest of the asteroids, Vesta has been classed as a protoplanet, one of the building blocks that formed terrestrial planets like the Earth. The Dawn mission revealed that Vesta's irregular shape and deeply scarred surface tell a story of how this small world was nearly destroyed by violent collisions in its past. Ceres is the closest dwarf planet to Earth and is the largest object in the asteroid belt between Mars and Jupiter. It is large enough for gravity to have molded it into a nearly spherical shape. Observations by the Dawn spacecraft reveal hydrated minerals, clays, bright deposits of salts, and signs of cryovolcanoes. Ceres likely has a large mantle of water ice and perhaps an internal layer of liquid water. Titan is Saturn's largest moon and the second largest moon in the solar system. It is about half the size of Earth and is larger than the planet Mercury. It is unique among the moons of the solar system in having a dense atmosphere. Observations from the Cassini mission and Huygens probe reveal mountains of ice and seas, lakes, and rivers of liquid hydrocarbons. Some researchers hypothesize these frigid bodies of liquid could be habitats for exotic forms of life. Saturn has 62 moons known to date, ranging from less than 1 kilometer to more than 5,000 kilometers in diameter. Many of these moons have surfaces composed mostly of ice, hence the moniker of icy moons. The larger moons explored by the Cassini mission are roughly spherical. Enceladus stands out for its geysers of water erupting into space, indicating a subsurface sea of liquid water and an intriguing possible habitat for life. The larger of Mars’ two moons, Phobos is a mystery. Is it a captured asteroid, or did it form from debris ejected from a giant impact on Mars? Its low orbit around Mars could make it an ideal stepping stone for our exploration of Mars, like a natural space station. But that orbit also means Phobos is doomed to be ripped apart by Martian tidal forces. Japan’s MMX mission is scheduled to launch in the early 2020s to return samples from Phobos’ surface. Mercury is the smallest of the eight major planets of the solar system. It is also the closest planet to the Sun. Its rocky surface has many features in common with the Earth’s moon including impact craters, plains, faults, and volcanic landforms. Though daytime surface temperatures can reach 800° F (427° C) over wide areas of the planet, massive deposits of ice can be found in permanently-shadowed craters near Mercury’s poles. Mercury was explored in the past by NASA’s Mariner 10 and MESSENGER probes, and is the focus of the European and Japanese space agencies’ current BepiColombo mission. The Solar System Treks are online, browser-based portals that allow you to visualize, explore, and analyze the surfaces of other worlds using real data returned from a growing fleet of spacecraft. You can view the worlds through the eyes of many different instruments, pilot real-time 3D flyovers above mountains and into craters, and conduct measurements of surface features. The portals provide exciting capabilities for mission planning, planetary science, and public outreach. Hyginus Crater and Rille There’s a lot to learn from the stories told by the amazing lunar landforms of Hyginus crater and Hyginus Rille. Hyginus Rille is the sharp, 220 km long depression stretching left to right (west to east) in this Moon Trek visualization using data from the WAC camera aboard the Lunar Reconnaissance Orbiter. Hyginus Crater is seen at the elbow-like bend in the rille near the center of the image. Hyginus Rille apparently formed when magma from the Moon’s mantle forced its way up through a crack in the lunar crust. As the intruding magma widened the crack, parallel faults were formed on the surface above. As the faults pulled away from each other due to the extensional forces below, the land between them dropped down forming a graben. Beneath the widening Hyginus Rille, chambers of pressurized foam formed at the top of the dike of molten rock, as dissolved gasses bubbled out of the rising magma. The faults above provided a path for that pressure to be relieved through what must have been spectacular pyroclastic volcanic eruptions. A dark blanket of volcanic ash from these eruptions can be seen surrounding Hyginus Crater. As the pressurized chambers were evacuated by the eruptions, they collapsed, resulting in volcanic pit craters on the surface. Hyginus Crater is the largest of those seen here, but a string of smaller pit craters can be seen extending to the northwest along the rille. Such pit craters are notable for their lack of raised rims. You can explore something similar here on Earth by driving along the Chain of Craters Road in Hawaii Volcanoes National Park. There was an intense debate for many years as to whether the Moon’s craters formed through volcanic eruptions or meteoroid impacts. We now know that the vast majority of lunar craters formed as a result of impacts. But as these examples along Hyginus Rille demonstrate, volcanic craters can also be found on the Moon. There’s another very curious aspect to this region. The floor of Hyginus Crater is an example of an Irregular Mare Patch or IMP. The Ina Caldera, about 325 km to the north, is the best-known of these IMPs. These mysterious features exhibit erupted volcanic material. Nothing special there. But the technique of crater counting leads to an estimate of very young ages for these areas, indicating eruptions that are far too recent to be consistent with our current thermal modeling of the Moon. But as Jim Head presented at the 2016 meeting of the Lunar Exploration Analysis Group, the foamy nature of the erupted material could lead us to seriously underestimate the ages of these features based on crater counts. Finally, take a look at the branching of the rille at the far right of this image. The upper branch actually connects Hyginus to another of the Moon's great straight rilles, the Ariadaeus Rille. Alluvial Fans Take a look at the crater in the center foreground of this Mars Trek visualization using THEMIS data from Mars Odyssey. Aside from the central peak, the crater’s floor is largely covered by alluvial fans. Note the fan radiating out from the canyon on the crater’s rim above and to the right of the central peak. Notice the smooth slopes stretching down from the rim on the left and the fan emerging from the canyon on the lower right. These look remarkably similar to the same kinds features here on Earth, and like the fans on Earth, they seem to tell a story of rocky debris washed down from high, steep slopes during intense precipitation. Imagine a deluge of water, sand, and rock flooding down from the crater rim during an intense Martian cloudburst. The size of these fans seems to indicate that they likely built up over millennia. All of this tells us something fascinating about past climate on Mars. The unnamed crater here is 63km across, and can be found at latitude -23.5 and longitude 74.3. Fans like this can be found in numerous craters across bands of specific latitudes on Mars. The “Alluvial Fans” static layer in Mars Trek can help you find more examples. Cone Crater This is Cone Crater, a 370-meter diameter impact crater in the Fra Mauro Formation on the Moon. On February 6, 1971, Apollo 12 astronauts Alan Shepard and Edgar Mitchell retrieved rock samples from near the rim of this crater for study back on Earth. In 2018, a team of researchers led by Jeremy Bellucci of the Swedish Museum of Natural History and including David Kring of the Center for Lunar Science and Exploration (part of NASA’s Solar System Exploration Research Virtual Institute) was conducting a detailed study of Apollo 14 rock samples and discovered something remarkable. Among the samples was a piece of rock that stood out. Analysis of the rock’s composition, enriched in quartz, feldspar and zircon, seemed to indicate that it originated not on the Moon, but formed between 4 and 4.1 billion years ago, about 12.4 miles below Earth’s surface. At that time, the young Earth, only about a half billion years old, was being repeatedly bombarded by great asteroid impacts. One or more of these impacts apparently excavated the rock, brought it to Earth’s surface, and then blasted it into space to land on the surface of the Moon. There, about 3.9 billion years ago, subsequent impacts seem to have partially melted the rock, fused it to surrounding lunar rock, and buried it beneath the lunar surface. Then, 26 million years ago, another asteroid impact blasted the Moon forming Cone Crater, bringing the rock back to the Moon’s surface. There it lay until 1971 when it was picked up by the crew of Apollo 14 and returned to Earth. It’s an amazing story. But even more amazing may be what this rock preserved on the Moon could tell us about our home world. The calculated age of this rock is older than any rock that has been found on Earth, where erosion and plate tectonics destroy records of the past. A preserved piece of the very young Earth could be one of the greatest treasures that has yet been returned from the Moon. Mairan Domes The Mairan domes are four steep-sided volcanic peaks in the northern part of the Moon’s Oceanus Procellarum. South dome is in the left foreground. The larger Middle dome is seen up and to the right. Mairan T, with its complex compound crater is directly behind Middle dome. North dome can be seen in the distance toward the central horizon, some 64 km from Mairan T. These are not your typical lunar volcanoes. Most volcanic domes on the Moon have very low profiles with very shallow slopes. This is because lunar lava tends to have very low silica content and was consequently very thin and runny when erupted. But studies of the sizes and shapes of the Mairan domes made using images from lunar orbit, and studies of the composition of the domes done with spectrometry from orbit indicate that these peaks were built with thick pasty lava rich in silica similar to dacite or rhyolite here on Earth. Volcanism with thin, basaltic lava was quite common on the Moon. But only in a few isolated locations such as this do we find examples of lunar silicic volcanism. Here on Earth, we have a pretty good understanding of silicic volcanism and its association with subduction at the boundaries of tectonic plates. But there’s no evidence of plate tectonics on the Moon. So what caused these few examples of thick, silicic lava erupting on the Moon? We just don’t know. These places are just begging for surface exploration. Generating a Moon Trek elevation profile for Mairan T, like the one included here, provides a way to appreciate the size and height of the volcano as well as the depth of its crater. Start your own investigation of these fascinating features at Moon Trek. Mojave Welcome to Mojave! Not the desert in California, but the crater on Mars. Mojave is over 50 kilometers across and about 1.5 kilometers deep. This view, looking south, was generated using Mars Trek combining data from the THEMIS instrument aboard the Mars Odyssey spacecraft and the MOLA laser altimeter aboard the Mars Reconnaissance Orbiter. Even more than its terrestrial namesake, the area surrounding this crater is very arid. But it wasn’t always. Look at the lobate ejecta blanket extending from the crater into the foreground on this view. This is characteristic of a rampart crater, and tells us that the impactor that created Mojave hit in an area with a large amount of subsurface water, possibly in the form of ice. The pasty ejecta around the crater very appropriately evokes images of throwing a rock into mud. Now take a look at the terrain behind the crater. It was extensively sculpted by massive outflow channels emptying huge volumes of water north into the great bay that occupied the area now known as Chryse Planitia. Close examination of the terrain in and around Mojave reveals the presence of classic alluvial fans. Here on Earth, alluvial fans just like these form as a result of heavy desert downpours, typically thundershowers. So did Mars experience drenching rains in the past? We see evidence in Mojave that this may have been the case. Clusters of small, closely-shaped pits on the floor of Mojave have been interpreted as resulting from the eruption of steam released when deposits of subsurface water or ice were heated by the energy of the impact that formed the crater. We see examples of this in other regions on Mars, and even on other worlds. (For an asteroidal example, take a look at the pitted terrain on Vesta north of the crater Marcia and highlighted in Vesta Trek). Mojave and its surroundings tell us amazing stories of Mars’ watery past, and of the large amounts of water that may be found even today beneath Mars’ surface. But those are far from the only stories that Mojave has to tell. A team led by Stephanie Werner of the University of Oslo has proposed Mojave as the source for the shergottites, Martian meteorites that have fallen to the Earth and into the collections of many meteorite enthusiasts (including me). They base this on comparing the estimated age of the crater with the time that the shergottites spent exposed to cosmic rays during their flight through space, along with similarities between the mineralogy of the Mojave area and the composition of the shergottites. So did the impact that formed Mojave cause pieces of Mars to rain down upon the Earth? Mojave’s role as the source of the shergottites is far from settled, and continues to be energetically debated in the journals and at planetary science conferences. But this just adds to the fascinating aspects of this remarkable crater. You can use the “Experience TrekVR” tool in many of the Trek portals to create your own virtual reality flyovers of terrain that interests you. We’ve also created a list of pre-made VR flyovers of some of the more popular sites to help get you started in your VR explorations. Use your smart phone to scan the QR code associated with each flyover, put your phone in a pair of cardboard-compatible goggles, and start flying. Keep an eye on this page! We’ll be updating it with new flyovers. These flyovers use data from the Wide Angle Camera aboard the Lunar Reconnaissance Orbiter to provide a broad view of the fascinating geography that led to these sites being selected for the first stages of human exploration on the Moon. For each site, we provide a screenshot map from Moon Trek showing the flyover path marked in yellow and a red X marking the landing site. We also include a QR code or browser link for you to use in viewing the flyover. The site of humanity’s first steps on the Moon was chosen for its flat, level, safe terrain. We can see this as we fly from the rugged highlands to the south to the smooth plains of Tranquility to the north. Another flat landing site was provided by Oceanus Procellarum – the Ocean of Storms, actually the Moon’s greatest plain of solidified lava. We fly south to north in this view. The landscape for this mission was much trickier, with lots of rolling hills to deal with. These were formed from rock debris blasted out by a distant asteroid impact on the Moon. In this view, we fly north over the area. At the base of the towering Apennine Mountains, Apollo 15 landed on the edge of Hadley Rille, a great channel carved long ago by flowing lava. Here we fly northward along the range of mountains and the lava channel. This was the first human mission to the Moon to land in the rugged, rough, ancient highlands of the Moon. In this view, we fly south to north. The final Apollo mission to the Moon made a spectacular descent into the Taurus-Littrow valley, deeper than Earth’s Grand Canyon. Here we fly over the valley from east to west. 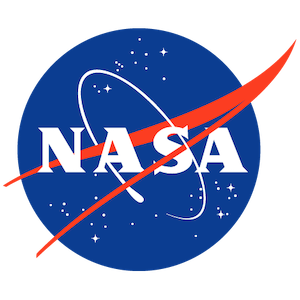 In January 2018, NASA conducted a workshop to discuss and identify potential future landing sites on the Moon for future missions. For more information see https://lunar-landing.arc.nasa.gov. Here are VR flyovers for some of the highlighted sites. For each site, we provide a screenshot map from Moon Trek showing the flyover path marked in yellow. We also include a QR code or browser link for you to use in viewing the flyover. These rare examples of tall, steep volcanic peaks on the Moon were formed by the eruption of unusually thick, pasty lava. This is an amazing collection of about 250 volcanic cones and domes averaging 200 to 500 meters in height. This plateau rising 2 km above the surrounding landscape is one of the greatest concentrations of volcanic landforms on the Moon. We follow the great lava channel of Schroter’s Valley for 175 km as it cuts across the plateau. This is one of the best examples of a mysterious “lunar swirl” - sinuous bright features with interweaving dark lanes. They seem to be caused by local magnetic fields on the Moon. This impact crater on the far side of the Moon features volcanic sites, unusual rock outcrops, and a number of areas that are permanently shadowed. This giant impact basin, about 900 km across, features multiple rings of mountains, deep fractures, and areas flooded by lava. From the solar system’s tallest mountain to its deepest canyon, Mars is a world of epic landforms. We explore some of them here. For each site, we provide a screenshot map from Mars Trek showing the flyover path marked in yellow. We also include a QR code or browser link for you to use in viewing the flyover. Towering three times taller than Mt Everest on Earth, Olympus Mons is the Solar System’s tallest mountain and greatest volcano. This view was taken with the THEMIS infrared camera aboard the Mars Odyssey spacecraft. Beside Olympus Mons, Mars’ Tharsis region features numerous other volcanoes, some of which dwarf any found on Earth. Here we fly, southwest to northeast over the gigantic peaks of Arsia Mons, Pavonis Mons, and Ascraeus Mons. This view is from the Viking Orbiter Camera. Mars’ Grand Canyon is staggeringly immense. If it were placed here on Earth, it could stretch all of the way across North America. Its walls tower as high as Earth’s tallest mountain range. Here we fly east to west above the canyon. This view was taken with the THEMIS infrared camera aboard the Mars Odyssey spacecraft. Mars is a complete desert today. But billions of years ago, water flowed across Mars’ surface. Today, we can still see great, dry, ancient river channels like Kasei Valles. In this color-coded view, the lowest areas are blue, higher areas are green, and even higher areas are yellow. As we fly downstream west to east, we can see how the landscape was carved and streamlined by vast amounts of flowing water. Vesta is the second most massive object in the asteroid belt, after the dwarf planet Ceres. It is considered to be a protoplanet, a kind of planet embryo and an example of one of the building blocks for larger planets. Its shape is not at all spherical, after massive impacts by smaller asteroids blasted away much of the southern part of the world. Vesta was studied in detail by NASA’s Dawn robotic spacecraft. For each site, we provide a screenshot map from Vesta Trek showing the flyover path marked in yellow. We also include a QR code or browser link for you to use in viewing the flyover. Fly from south to north over this spectacular impact crater, 65 km across and the largest of the three craters forming Vesta’s “Snowman” formation. End at the “pitted terrain” north of Marcia. This cluster of small, rimless pits may have formed when deposits of subsurface ice were heated by the impact that formed Marcia. The ice turned into gas and erupted violently, resulting in the pits at the end of your flight. Fly south over the rim of gigantic, 500km-wide Rheasilvia Crater, across it’s rugged floor, and over its towering central mountain peak - 23 km high and one of the tallest mountains in the solar system. The impact that caused Rheasilvia nearly destroyed Vesta and left this crater covering much of the Vesta’s southern hemisphere. This is the largest of a series of great parallel valleys formed by faults that resulted from the titanic impact that formed Rheasilvia Crater. Divalia Fossa is considerably larger than the Earth’s Grand Canyon. Located within the asteroid belt between the orbits of Mars and Jupiter, the dwarf planet Ceres measures 945 km across. Ceres seems to have a rocky core surrounded by a thick mantle of ice (and perhaps even some liquid water, beneath a crust rich in clay and carbonates. There are many signs of active geology on Ceres. The role of lava on Ceres was played by water, erupted as liquid from below and building mountains of ice. 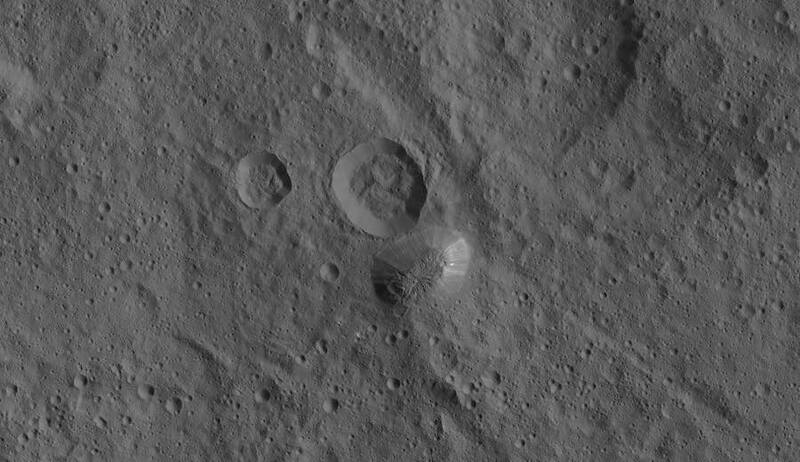 Ceres was studied in detail by NASA’s Dawn robotic spacecraft. For each site, we provide a screenshot map from Vesta Trek showing the flyover path marked in yellow. We also include a QR code or browser link for you to use in viewing the flyover. Fly north over this magnificent impact crater that stands out with the brilliant white spots or faculae on its floor. These are salt deposits probably remaining after briny water erupted from beneath Ceres’ surface. This is Ceres’ tallest and seemingly youngest example of a cryovolcano – a volcano made largely from ice and resulting from erupting water. It stands about 4 km tall above the surrounding landscape. White streaks on the mountain’s slopes are probably deposits of salts. Fly northwest along one of these great parallel cracks in Ceres’ crust stretching for over 100 km. They were apparently formed by material from Ceres’ mantle pushing up and fracturing the crust. Start out here for a general view of Ceres’ youngest and most impressive ice volcano. Then switch to 3D mode and fly around the peak for detailed inspection. Have Google Cardboard or a set of VR goggles? Open the Tools panel to draw a path to float along with full 360 views, or get started with some of our favorite fly-alongs in our Virtual Reality Library. If you are unfamiliar with QR codes, watch the short video below to see how it works with Trek Virtual Reality. Currently not available in Titan or Icy Moons Trek. Pick a feature or area that you would like to 3D print and we'll give you the file! Or, if you want to 3D print the entire globe, we have those files pre-generated for you. Just go to our Tools situated in the top-right corner of each Trek when viewing the Global (or 2D) Map. Explore the Moon, Mars, and Vesta in 3D. Spin our moon, the Red Planet or the huge asteroid around its axis, orient it whichever direction you want, and approach from any angle. Change the projection or view by clicking the globe or '3D' button located at the bottom-left of any Trek. Draw a straight line, a polyline, or freehand your own proposed rover traverse, and we'll give you the distance. It may look tiny on the map, but you'll be amazed how huge (or small) these celestial bodies are. Draw your line, polyline, or freehand polyline and let us do the calculation. Draw a line, polyline, or freehand polyline and see how the elevation changes. We extract the elevation profile from a digital elevation model (DEM) of the terrain and give you the results in an interactive graph. If you would like to see numbers in a convenient format, simply export the elevation profile to a .csv file. Note: The GIF shows an older version of our elevation profiler. The current one, which you can access on the respective Trek sites, works in the same way AND has a nifty zoom feature. Try it out and let us know what you think in the Feedback link below. Select 'Calculate Sun Angle' from the Tool menu then place your marker. Choose the start and end dates and times, set your interval and submit. (The default interval is set to 50 and will display 50 data points interspersed equally between the start and end time. The lower the number, the less accurate the results because the less frequent the readings.) The results are given in a graph showing the Elevation and Azimuth of your placed marker to the sun. Most of the map layers shown from Treks are available through OGC RESTful Web Map Tile Service (WMTS). Through this service, you can display map layers from Treks on your software system. Read through our documentation at WMTS Layer Services.